The Okuma API basically works the same way. 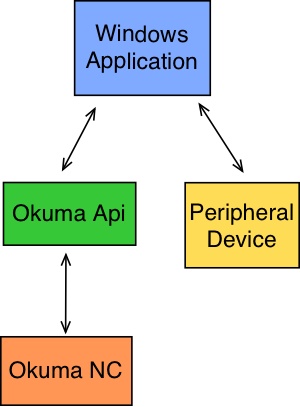 When programming a Windows application using “Visual Basic” or “C#” (pronounced “C Sharp”) you can safely access the Okuma Machine Language through the API. You do this by creating a reference to the API and then calling specific methods in your code. Where tboxCV is the name of the text box and the .Text is the property of the textbox that I want to place the value into. The objVar.GetCommonVariableValue is the actual part of the API that allows me to access the Common Variables. The (100) is the specific Common Variable I want the value from. This method will return the value in a Double format ( Which is basically a number with a possible large Decimal value) and display it in the textbox. Because many devices can be accessed using a Windows application you now have a very powerful weapon when it comes to Okuma machine tools. For example with your Windows application you could communicate to a set of measurement instruments and, when a measurement is out of spec, communicate to the Okuma NC and automatically change the tool offsets. You could create a graphical user interface that allows for faster setup times, less data entry mistakes, and easier training of new employees. The possibilities are only restricted by our on thoughts, I’m constantly amazed when someone call me with a question about using the API to do some obscure little thing like emailing a machining report after a part has been completed. It makes perfect sense in their situation, but I have to wonder what they do about they’re non-Okuma machines.